Glass Art Show at Red Butte Garden. The Glass Art Guild of Utah returns to Red Butte Garden for the 16th Annual show of kiln work and blown glass. Large and small pieces including garden art, decorative boxes, plates, trays, bowls, sculptural works, and jewelry pieces will be on display. Items displayed will be available for sale. Regular garden admission. Ogden’s Christmas Village. The Christmas Village lights Ogden’s downtown area with displays and lights. The setting is modeled after Santa’s village at the North Pole. The lights are on from 5pm to midnight every night and admission is free. Visit the website for more information and other holiday events. Places to tube around the valley include Soldier Hollow in Wasatch Mountain State Park, Gorgoza Park in Emigration Canyon, Wasatch Parc at Cherry Peak Resort in Northern Utah, Brian Head Resort, and Snowbasin Resort. Visit their websites for more information. The Gallivan Center, 50 E 200 S, Salt Lake City, is open for ice skating Monday thru Thursdays from 4pm to 9pm, Friday and Saturday from noon to midnight, and Sunday from noon to 7pm. To try the “fastest ice on earth” visit the Olympic Oval in Kearns at 5662 Cougar Lane. Check their website, for dates and times. 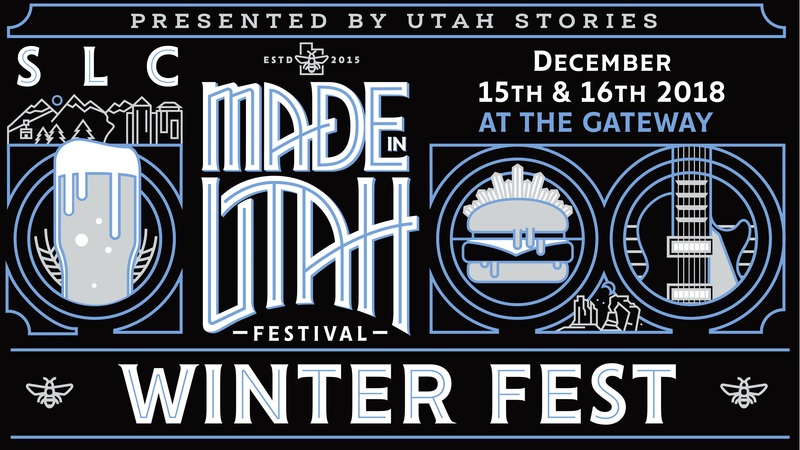 Made in Utah Winter Fest, sponsored by Utah Stories. The kick-off party, an over-21 event, will be held December 14 from 6pm to 9pm at the Gateway, 162 S 400 W. Tickets for the kick-off party are $40 in advance and will include food, drinks, giveaways, and entertainment. The Winter Fest, a free, family friendly event, with over 70 vendors, will be held December 15 from noon to 8pm and December 16 from noon to 6pm at 14 S Rio Grande Street and the Gateway Plaza. Vendors will includes distilleries, breweries, restaurants, product makers, food trucks, along with live music. For more information visit the Made in Utah Winter Fest website. Run, Run Reindeer — 10K, 5K, 1M run. This race is held in Ivins, Utah and is a family fun run. The race starts at 9am at the Ivins City Park, Main Street and 100 N. The race includes Christmas music along the route and Run Run Reindeer selfie stations. There are also prizes and giveaways including a $50 gift card for the ugliest Christmas sweater. Bring a new, unopened toy for Toys for Tots. Go here for more information visit . Celebrate 2019 at Snowbird with a New Year’s Eve Torchlight Parade and fireworks. The parade and fireworks can be viewed from the Plaza Deck from 6 to 6:30pm, followed by fire pits and hot cocoa from 6 to 7pm. Stick around for holiday dining options and New Year’s Eve dinner. For more information go to their website.